I know I’ve gone on and on about how much I love rhubarb, but this week I’ve got proof, in the form of two different rhubarb recipes. The first is this rhubarb liqueur. It was actually inspired by one you can buy, called Rhubarb Tea. I say “inspired by,” but what I really mean is that I tried it, and thought to myself that I could do better (though they do have some cocktail recipes using their version that sound good). The rhubarb flavor just wasn’t strong enough for me. 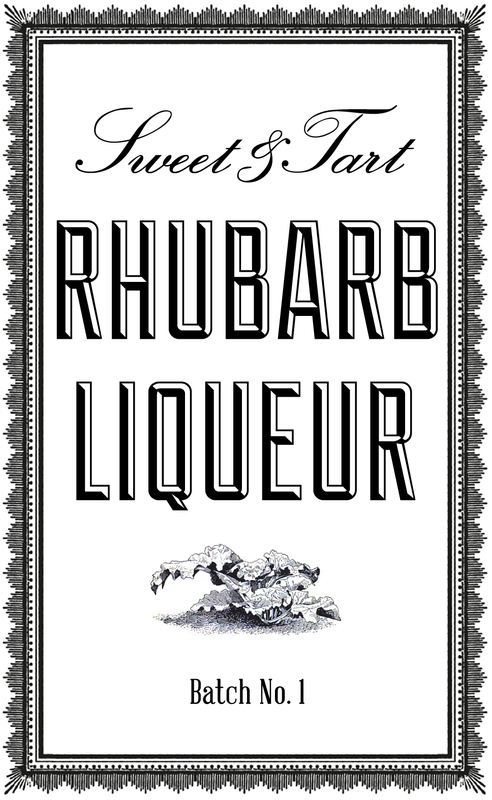 So I looked up some recipes online, and came up with my own rhubarb liqueur. I hope it doesn’t sound too immodest to say that it’s way better than the store-bought version, with a much stronger rhubarb flavor. Unfortunately, even though I made a double batch of the recipe below, it’s so delicious that I think it’ll all get drank up in less time than it took to make. Guess I’ll just have to make more! Place the chopped rhubarb in a large resealable jar (a Mason jar works well), and add 2 Tbsp of sugar. Cover, and shake to coat the rhubarb and help release the juices. Add 1/4 cup water and 1 1/2 cups Everclear, or enough to just cover the rhubarb. Seal jar and let sit, shaking occasionally, for 2-4 weeks, until the color has leached out of the rhubarb. Using a fine-mesh strainer, strain out rhubarb, pressing on the solids to remove as much liquid as possible. You should end up with approximately 2 cups of liquid. In a saucepan, add 1/2 cup sugar to 2 cups water; bring to a boil. Allow to cool, then add to rhubarb-alcohol. Mix. At this point you can allow the flavors to mellow for a week, but it’s good right away, too. This stuff is very good on its own, but I like it even more with a little bit of lemon. Mix about 6 oz. rhubarb liqueur with the juice of 1/2 lemon. Add a couple of ice cubes, and garnish with a mint sprig or small stick of rhubarb. Enjoy! As with the ginger liqueur, I couldn’t resist making my own label. It’s hard to tell in the photos above, but I even found a cute little vintage illustration of a rhubarb plant. I printed it out on this clear label paper, and then I sealed it with a couple of layers of clear acrylic spray sealer. With my last label, I found that alcohol drips made the ink run, but the sealer has prevented that from happening on this one. I haven’t tried it yet, but I recently discovered that there is printable waterproof vinyl, which might also work well for labels. Please feel free to download and use my label if you’d like. This sound yummy! But everclear is illegal in Maine…do you think the highest proof vodka would work? I too love rhubarb! Non alcoholic rhubarb syrup, homemade, of course with seltzer is very refreshing. No apologies for homemade better than store bought…one word…carrot! Thanks for you great blog! One of my favs! And of course then you’d want to reduce the water so the total end volume was 4 cups. Thanks! I didn’t know that math…I have 100 proof vodka for making herbal tinctures…I will save this info! Keep the ideas coming and I will try to find more time! 🙂 4 etsy shops, big gardens etc. I love new ideas always though!!!! By “seal the jar” do you mean like in canning seal, or just screw the lid in seal? Also, if it’s just screw on the lid seal, do you store in fridge, or is the alcohol preservative enough? Thanks! Excited to try this!!!! my rhubarb in the garden is not yet mature enough to try this out. patrickofbruges, rhubarb ice cubes are a great idea!